Howard Clark and Jarrod Ducat, the duo behind Georgetown’s famous vegan restaurant Squid and Ink, are bringing their vegan goodness to Broadway. Highline will occupy the former Club Lagoon space at 210 Broadway East. They are hoping to open by the beginning of May. Sadly, the Lamborghini will have to come down. Jarrod explained that they have been wanting to open a Capitol Hill vegan place for a while, since Squid and Ink draws a great number of Hill residents who have been clamoring for them to open on the Hill. He also noted that Highline will be a bit bigger and rely more on foot traffic than Squid and Ink. Like Squid and Ink, Highline will have a full bar. Highline will join In the Bowl, Plum, Sage, and Teapot Vegetarian House as establishments that serve all vegan food on the Hill. And of course, the grande dame of all vegan places lies proximate to the Hill – Cafe Flora in Madison Valley. it’s me, howie clark, and dylan desmond starting highline. it will be a full bar/nightclub. squid & ink is beer/wine/all ages. we will have bigger shows and bar type events/games/activities/djs/karaoke/booze/and fun, as well as a vegan menu(lunch, appetizers, bar grub, and a possible weekend brunch)… but this time around we will be focusing heavier on the entertainment/nightlife side of things and let the food speak for itself…. it will definitely have a different feel than squid & ink, or wayward cafe(a previous endeavor) but not in a way that will disappoint. i feel we would probably fall more in league with comparisons to cha-cha/linda’s than plum/in the bowl…except we will have meatless snacks. I’m no vegan but I’ll eat there at least once to thank them for taking down that stupid car. I love Squid & Ink, so glad they’re bringing something to the Hill. It’s so nice to have more variety for vegans within walking distance. I would never have dared go to Club Lagoon when it was open but I walk by that car almost every day on my walk home and have a good laugh at it’s rediculousness. That car marked the beginning of the end for Broadway. 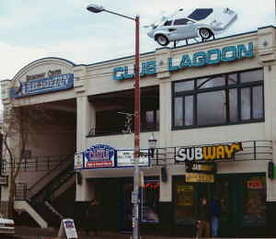 I might be projecting, but didn’t Club Lagoon have a fur-lined car/booth inside? I can’t think of a better replacement for that space than a vegan restaurant. YUM! I remember hearing about this and kind of thinking it was a joke. So glad it’s not! I gladly welcome Squid n’ Ink up here. Their food is delicious but I only really get the enthusiasm to go down there when they have shows. And with that, I wonder if they’ll still be hosting shows at their new location. I hope so. for 75k. Capitol Hill probably a better location anyway. Unless Juliano’s has changed, it shouldn’t be included in the list of all-veg restaurants. It’s very vegan friendly, but it also serves meat. What *should* be included is Teapot House, which is vegan. Looking forward to seeing what this new place turns out to be! Always nice to have another option on the hill. I second the shout out for Teapot! One of my favorite restaurants in the city! The last time I was in there it was completely dead. When I asked the server how business has been she said it has been really slow. Definitely give it a try if you haven’t already. So excited that I won’t have to head out to Gtown for a Squid & Ink fix. Highline is going to be a great addition to the hill. Thanks for the heads up! I’m so glad to hear that tacky car is to be removed. It never seemed a good fit for the “Seattle vibe” or for Capitol Hill…more suitable for somewhere in L.A. Good riddance! Thatt damn lamborghini never fit in the neighborhood. This isn’t South Beach for gods sake!! Oh – and good riddance to the cheesy car. It’s always seemed like a really bad joke…. I’m not a vegan but I love vegan food. It will be nice to have more vegetable-intense foods on the hill. Regarding Teapot, I just discovered their fried spring roles….they are the best spring rolls in the whole world. My boyfriend and I call them Pie Sticks because they are so delicious and have a sneaky cinnamony flavor and the dipping sauce tastes just like pie filling. If you haven’t had them, go get some NOW! Their dumplings and wonton soup are also really good. Noted – I will definitely try their spring rolls. Thanks for the suggestion! Oh man I am so excited for this. oh please let there be vegan brunch on the weekends! Loved Squid & Ink when visiting Seattle – looking forward to Highline next time we’re there! Did the Teapot, the other “granddaddy of them all” close? Thank goodness that car is gonna go. Talk about ugly and really tacky!!!!! Sell it to the scrap yard!! Any clues as to when it is slated to open? But beyond the association with an obviously fraudulent religious leader, I do enjoy their vegan fare. I could the fried lotus root everyday. But beyond the association with an obviously fraudulent religious leader, I do enjoy their vegan fare. I could eat their fried lotus root everyday. I’m so happy to hear about this opening. It’s been a long time coming. wrt to Teapot, you’re confused. they’re not affiliated with supreme master, thats a different restaurant — Loving Hut. FINALLY a cool bar on the hill not full of taxidermy! And yay even vegan food! Great idea, can’t wait for it to open!!! That car was like a beacon for lowlifes heading up Broadway and John. Ultimately the neighborhood won out, and whatever out of towner that stuck it up there is gone. Good riddance to out of town trash. I would wish them luck, but their downfall first at Wayward then at Squid and Ink had nothing to do with luck, but everything to do with tragic inconsistency of quality, and too often bad service. So I wish them consistency and good service. When they were good, they were very good! So I hope to see high standards maintained. And, seriously, Flora is not a vegan spot. They have a few decent vegan dishes, but then, so do Subway and Taco del Mar. No need to put a yuppie vegetarian mecca in a list of vegan places in the first place, let alone anoint it the “grande dame.” It’s more like the stuffy aunt.